As the internet makes it increasingly easy to buy and sell goods and services abroad, overseas transactions are becoming commonplace for many of our small business clients. Here we look at how to deal with these transactions from the perspective of UK VAT. VAT registered businesses trading with each other are able to pass the VAT down the supply chain. It is the consumer at the end of the chain who ends up with all the VAT and is unable to reclaim it. As it is the consumer who ultimately pays the VAT, VAT is known as a consumption tax. The EU has set up a series of rules in order to allow small businesses to trade within it without having to register for VAT in each different country. As a result, the treatment of overseas transactions within the EU is different to those outside it. Before we discuss all the potential scenarios, we must first clear up a couple of definitions which heavily impact the VAT treatment of different transactions. A very important distinction for VAT is whether someone is a consumer or whether they are business. Generally speaking, if a person or company is VAT registered it is a business for VAT purposes. If not, they are a consumer. This does mean that a business will count as a consumer if it is not VAT registered. To be considered as a business sale, you must have the customer’s VAT number. Both your VAT number and the customer VAT number should then be included on the sales invoice. Any sales to EU businesses must also be included on an EC Sales list. This is a separate return at monthly or quarterly intervals which may not run to the same schedule as your VAT returns. The difference between goods and services is clear in most cases as goods are usually tangible items. For example, a table, a car or a cricket bat are obviously goods; while builders, lawyers and accountants are supplying services because the customer is paying for the skills of the individuals in question. The HMRC definition of a supply of services is simply ‘something other than supplying goods…done for a consideration’. If you are buying and selling solely within the UK you do not need to worry about whether you are dealing in goods or services. However, once you trade outside the UK, this distinction becomes important. 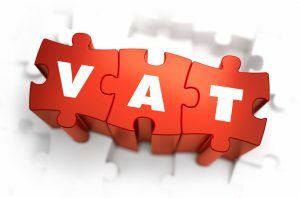 This is because VAT is charged in the jurisdiction deemed to be the Place of Supply of a transaction and this differs if we are dealing with goods or services. The Place of Supply of any sale of goods is based on where the seller belongs. Therefore, if you are exporting goods to a consumer in the EU, you must charge VAT at your usual UK rate. However, if you are exporting to a business in the EU, you are OK to zero-rate the transaction for UK VAT. As long as you have the business’s VAT number, it is their responsibility to account for the VAT at their local rate. The customer can then usually reclaim this local VAT back using the “reverse charge” on their VAT return. If the transaction is to outside the EU, it is again zero-rated for UK VAT purposes. This is irrespective of whether the customer is a consumer or a business. The importer of the goods will then pay VAT on the goods at the local rate. In the UK, the port receiving the goods will often insist on the UK VAT being paid by the importer before the goods are released into the country. The treatment of any sale of services varies depending on whether you are selling to a consumer or a business. If a service is being sold to a consumer, then the Place of Supply is determined as being where the supplier belongs. A UK exporter of services will therefore account for UK output VAT regardless of where the customer is situated. This is known as the “origin basis”. However, if the sale is to a business, the Place of Supply is where the customer belongs. This is known as the “destination basis”. A UK customer of imported services will thus account for UK output VAT and then immediately reclaim it on the same VAT return under the reverse charge system mentioned above. There are also different rules and processes for sale of digital services to consumers in the EU. In that case the VAT must be charged at the local country rate and returns submitted using VAT MOSS. What about the Flat Rate Scheme? If you are in the flat rate scheme then you are usually unable to reclaim VAT on your purchases. Your VAT obligation is calculated as a percentage of your gross sales turnover for the period. If you are selling goods or services to EU businesses then you normally zero rate the sale so no VAT would be included. But how does this fit with your flat rate turnover calculation. As we mentioned before, when you sell goods to the EU, the Place of Supply of the goods is where the seller belongs. This means it is within the scope of UK VAT so, even though you have zero-rated the goods on your invoice, you unfortunately need to include the sale in your flat rate turnover calculation and EC Sales list. If sales like these start to make up a significant portion of your business you should consider reverting to the regular VAT scheme. However, there is better news for sellers of services to the EU who are currently on the flat rate scheme. As the Place of Supply is where the customer belongs, these transactions are outside-the-scope of UK VAT. They can therefore be left out of your flat rate turnover. They should however still be included on your EC Sales list.